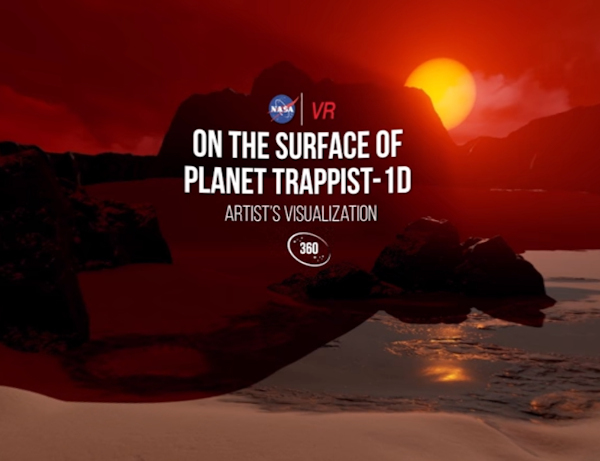 The animation, which can be viewed on YouTube but is best experienced through a VR headset, is based on the latest scientific data about this planetary system. Standing on the surface, TRAPPIST-1d’s sister planets can be seen as bright points of light in the distance. Exoplanets are simply planets that exist outside of our own solar system, and recent discoveries in the field have included Proxima b and the findings of the Kepler mission. Despite the scale of the system, the first details about the TRAPPIST-1 star and three of the exoplanets were revealed previously by Michaël Gillon of the Institut d’Astrophysique et Géophysique at the University of Liège in May 2016. At the time, the researchers said TRAPPIST-1, also known as 2MASS J23062928-0502285, was a “world first discovery” as the atmospheres of the planets were in reach of telescopes for the first time. The 360-degree exoplanet discovery video works on a desktop browser on Chrome, Firefox, Internet Explorer, and Opera. To view it on your phone, use the YouTube app.